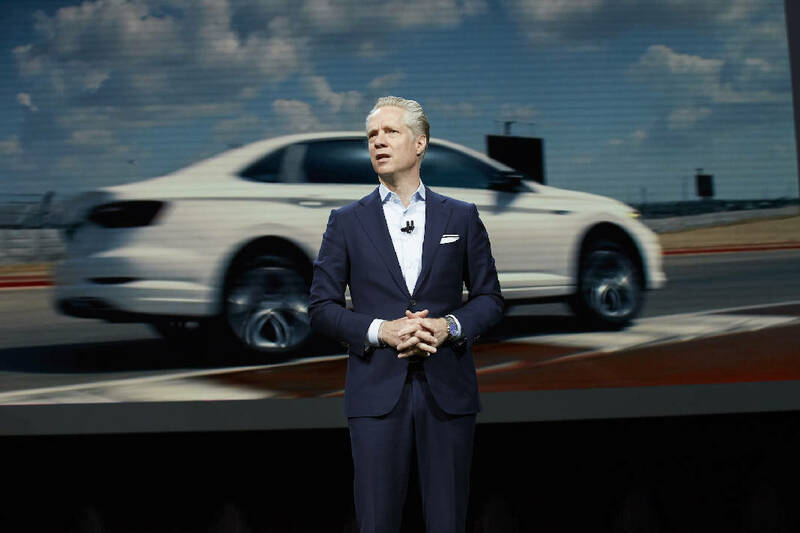 Photo contributed by Volkswagen / Scott Keogh, CEO of Volkswagen Group of America, talks about planned Chattanooga electric vehicle plant at the North American International Auto Show. Volkswagen Group of America CEO Scott Keogh says planned Chattanooga electric vehicle plant could serve markets in addition to North America. › Job: President and CEO of Volkswagen Group of America as well as head of the VW brand for the North American region since Nov. 1, 2018. As head of the Group, he oversees U.S. operations of VW, Audi, Bentley, Bugatti, Lamborghini, and VW Credit Inc.
› Background: A native of Old Brookville, N.Y.; married, two children. 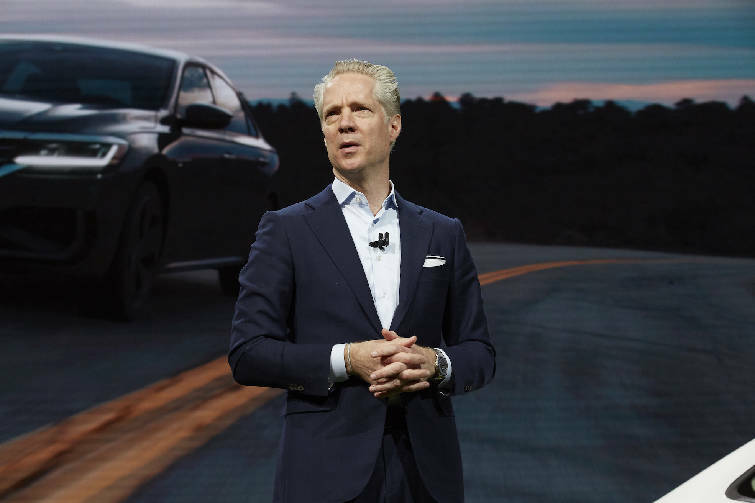 › Experience: Joined Audi of America in 2006 as chief marketing officer and was its head when he was named to succeed Hinrich J. Woebcken in current post. › Track record: While at Audi of America, sales for the brand doubled from 2010 to 2015 and it reached record customer satisfaction levels. Scott Keogh, president and CEO of Volkswagen Group of America, says he's an optimist on the electric car market. Consumer sentiment and interest is growing in battery-powered vehicles, he says, but what's needed is the right car on the market and hitting the right price point. Last week, Volkswagen unveiled plans to invest $800 million in a new facility in Chattanooga and hire 1,000 more workers to make electric vehicles. Work on the new plant is to start in the spring. It will be attached to the existing facility that makes the Passat sedan and Atlas SUV and the five-seat Atlas Cross Sport SUV later this year. An all-electric SUV is slated to come off the new plant's assembly line in 2022. The Volkswagen Group worldwide is investing about $50 billion in electric vehicles, and officials have said the company plans its last generation of combustion engines to be launched in 2026. Q. With stable gas prices, that has kept the demand for electric vehicles fairly modest. What ideas does Volkswagen have to drive demand? A. Of the total market, 50 percent is Tesla. The other 50 percent is a series of launches and cars which had some success to middling success to less success. From what I can see, consumer sentiment, desire and interest in electric vehicles is growing. What's needed is to get the right car on the market, hit the right price point. The right thing is to market and promote and get it out there and away you go. It is a bet. It is a risk. I think, fundamentally, it's one worth taking. There's a triangle. There's the government side with mandates , technology innovation and the cost of innovation, and consumer acceptance. I see all these things converging to make this thing go. Q. What markets will that plant serve other than North America? A. We haven't laid that out yet. We anticipate it will go to other markets. We'll start to slice this off. I do anticipate that if there are opportunities, we'll pursue them. It's something we'll continue to look at. Q. Do you anticipate using creative means to fill capacity at the plant, or involve other brands in the Volkswagen Group? A. We'll be smart about utilization. We'll be localizing two products. We're not announcing anything yet on the electric car platform. That platform is used by other group brands. That's something we may take a look at as well. That's why Chattanooga makes sense. We can be smart about the investments. Q. What are dealers saying about the electric vehicles? There's a big chunk who do know this is going to be happening. They would much rather see us at the front end of the wave rather than be out on the ocean, as opposed to being out in the ocean and missing out on the whole wave entirely. Q. Did VW consider anyplace else than Chattanooga? A. We thought about it. We held informal conversations. But it still came down to we have a great relationship with the state of Tennessee, a good relationship based on trust. We have utilization and efficiency for the plant. There is infrastructure there in terms of all the suppliers. We're going to work together a lot [with the state] on vocational-technical training. This is a different work force requirement in many regards, to do not only what's happening with cell chemistry and batteries coming to us, and then assembling that. Q. When do you expect for the existing Chattanooga plant to be profitable? A. The Chattanooga plant is profitable. I'll not share figures, but it's profitable because it sells cars and exports. Q. High on your wish list is a pickup truck in America? A. It's an opportunity we're very excited about. If you look at VW right now, we've shown one idea. It's Atlas based. We're holding conversations with another company, and looking at other ideas. The trick for us, we think it's a cool segment and cool opportunity. Anytime a segment gets big like the pickup segment is, it starts to diversify. They're moving from pure work vehicles to lifestyle vehicles. Q. Where are the customers going to come from for the five-seat Atlas Cross Sport? A. We're 70-80 percent conquest brand. We used to do 9 percent SUVs, now it's 48 percent. We view Atlas as a family vehicle. As we look at the Cross Sport, it will probably lean a little bit more pre-family or post-family. A lot of people want a stylish very cool car. Q. Is there any impact from the new USMCA agreement that replaced NAFTA? A. Not yet. We've obviously run all the analysis. The two biggest things is regional sourcing, particularly on that front with U.S. steel. The second is done with labor value contracts, 40 percent of value needs to come from people paying $16 or more an hour. Most of that is sitting on suppliers. They'll have to move from Mexico to the States. It's got to be something of high value. We're holding these conversations with suppliers. It's going to drive some big shifts. Q. Is there an opportunity for Chattanooga on the supplier side? A. Absolutely. There's a definite opportunity on that front, but you have to hit the high-value stuff, such as transmissions.